To use data from Cytoscape networks in an external application, the data has to be exported. As a Cytoscape network consists of a number of different types of data, there are options in Cytoscape for each exportable data type. 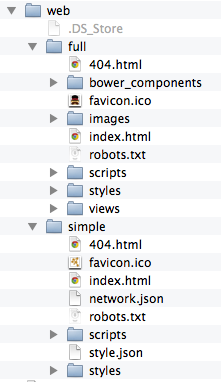 These options (Network, Table, Styles) can be found on the File → Export submenu (shown above). The Network to NDEx and Collection to NDEx options are used to store a network on a public NDEx server. You can use an NDEx server as a cloud-based store for your networks, as a means of sharing networks with collaborators, or to archive networks for publication. 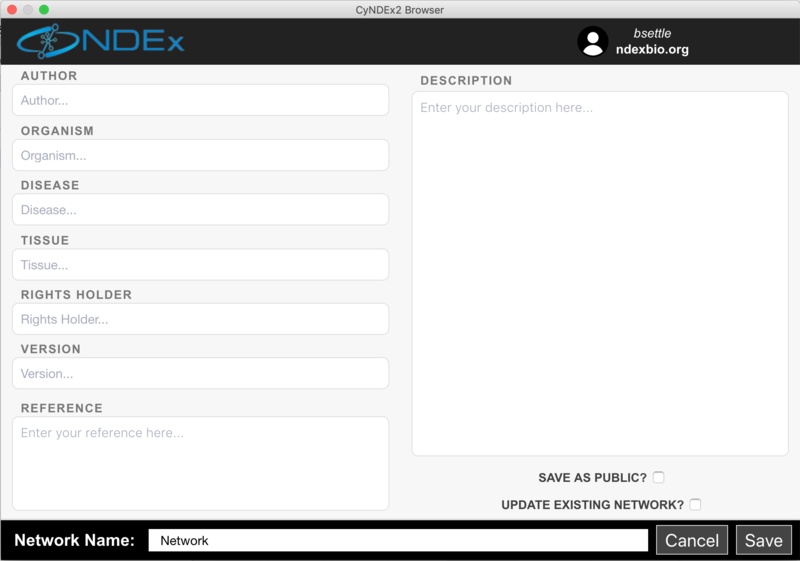 To store a network, you must have an NDEx account, which you can create by visiting the NDEx Public Server website. 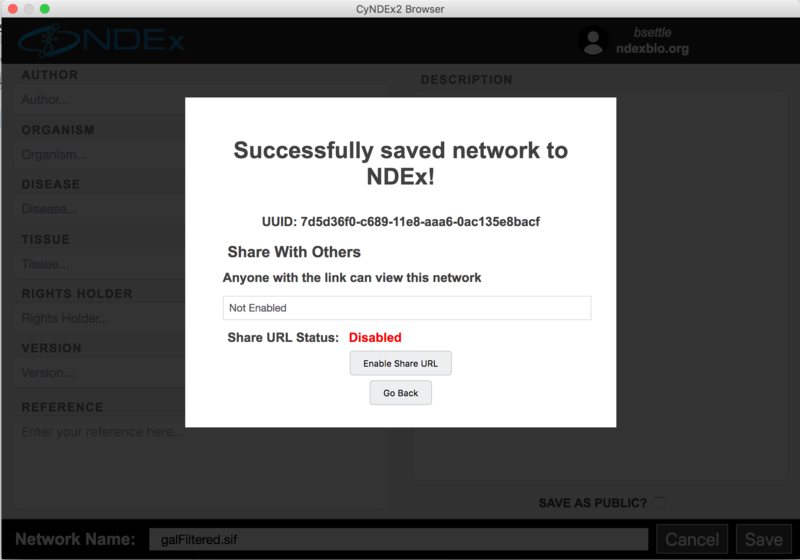 The Network to NDEx option saves only the currently selected network to your NDEx account. Such networks are suitable for processing by other applications and web services, as they contain only the nodes and edges in the selected network – other networks and the nodes and edges unique to them are not written. 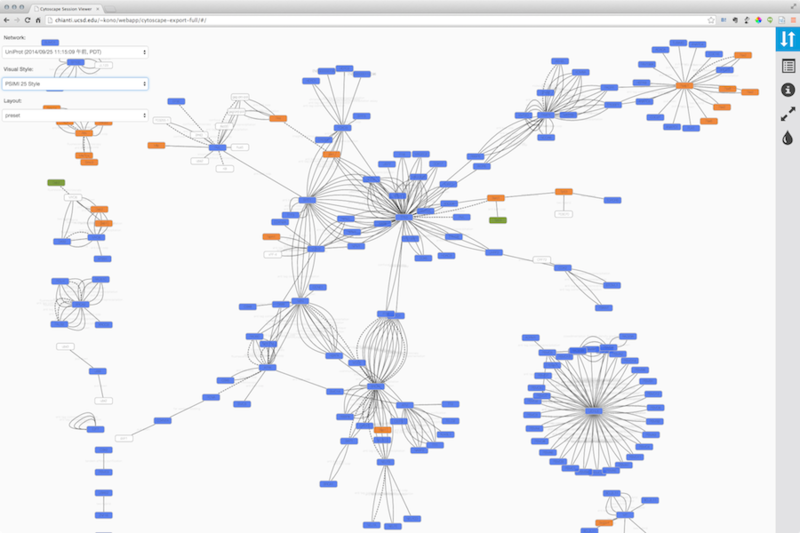 If you import this network (using the Cytoscape Search bar), only the single network will be loaded. The Collection to NDEx option saves all networks in the collection containing the currently selected network. 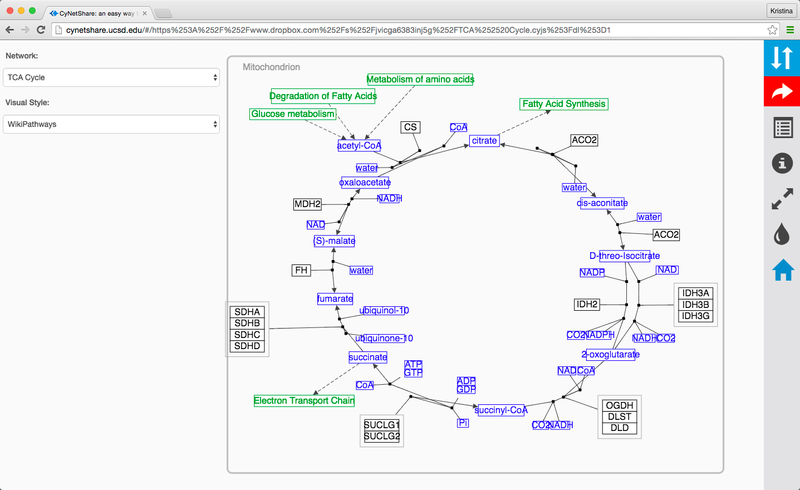 If you import this collection (using the Cytoscape Search bar), the entire collection will be loaded. This option is closest to saving an entire Cytoscape session, except that only the current collection is saved. When you select either option, the CyNDEx-2 Browser dialog will appear and enable you to provide metadata that will be displayed during subsequent NDEx searches. To save a network, you must add an NDEx account profile to the CyNDEx-2 Browser (by filling out the profile form reachable by clicking on the Anonymous credential in the upper right), and then make it current. You can set the name of your network by editing the Network Name attribute at the bottom. The Update Existing Network option enables you to overwrite an existing NDEx network if you have permission. If you choose to make your network public, you must fill in the Version and Description attributes. Choose the Save as Public option to enable collaborators to load your network. Menu actions have also been added to the network and collection context menus in the Cytoscape Network panel, as another method of accessing the network save dialog. 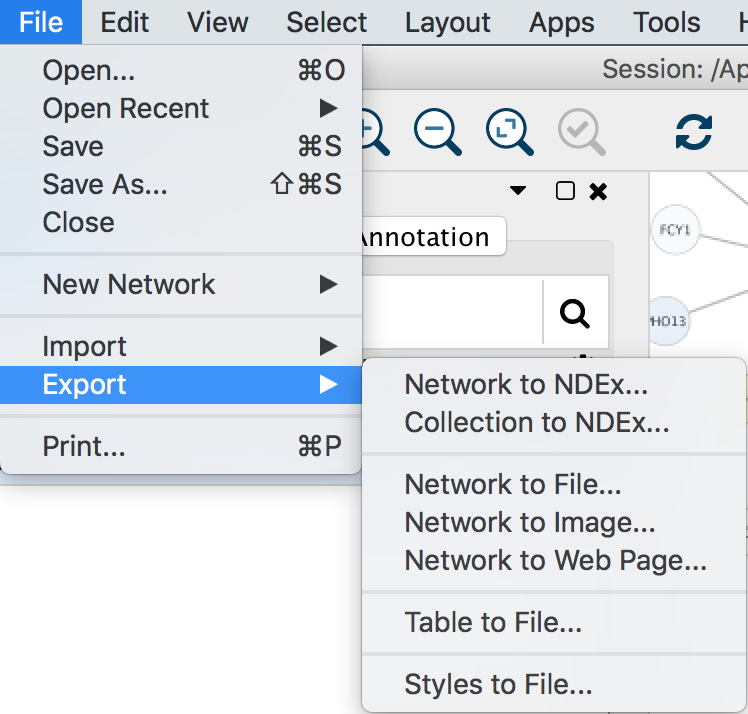 When the export to NDEx is complete, you will be given an opportunity to capture the network’s UUID in your clipboard. The UUID is suitable for e-mailing to colleagues so they can load your network via their Cytoscape Search bar (provided you selected the Save as Public option). For more sharing options, see the NDEx Public Server website. Further information on NDEx is available at the NDEx Informational/Doc website. The default format is SIF, which is a simple tab-delimited network format that provides node names and edge interactions only. You can choose the format using the dialog drop-down box. A file name is automatically suggested based on the network name and selected format, with the file path defaulting to the current working directory. You can change the suggested file name/path using the text box or Browse button. Press OK to export with the selected options. The Table option is used to export any of the data tables that are available in the current Cytoscape session. This includes the node, edge, and network tables that can be seen in the Table Browser, as well as any unassigned tables. The only currently supported file format currently for export is CSV (comma-separated value). The export dialog for Table has only two selectable options - the table to export and the file name (file type is always CSV). A file name is suggested based on the name of the selected table with the path defaulting to the current working directory. As in Network, the suggested file name can be changed using the Browse button or the text field. Press OK to export the selected table with the given file name. The Styles option is used to export one or more visual styles available in the current Cytoscape session. Supported formats include Style XML (which can be imported by 3.x versions of Cytoscape) or Cytoscape.js JSON (which can be used with Cytoscape.js, described in future sections). Style export has three options - the export format (as described above), the style(s) to export, and the file name (a suggestion will be made based on the current directory and file type). As in Network → Table, the suggested file name can be changed using the Browse button or the text field. The list of styles is a multiple-selection list - one or more can be selected using Ctrl/Cmd-click (to select multiple discontiguous elements) or Shift-click (to select a contiguous element range). Press OK to export all selected styles with the given file path. When you finish your data analysis and visualization, you can publish your data to share the results. 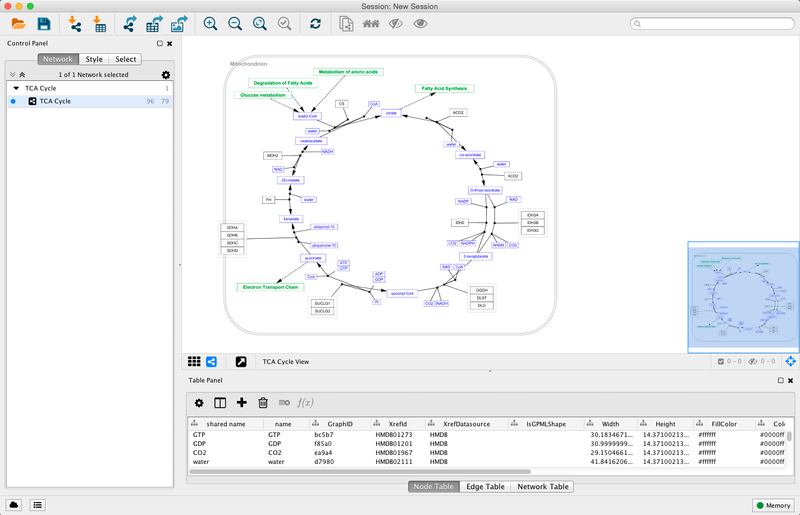 Cytoscape has several options to do this, with most options suitable for Cytoscape users and other options suitable for programmers wanting to create unusual or complex network viewers. These are further explained below. For more information on NDEx publishing and sharing features, see the Publishing in NDEx and Sharing Networks in NDEx tutorials. Another easy way to share your results with others is simply saving everything as a session file (which is a zipped session archive). You can save your current session by clicking the Save Session icon. You can save to a thumb drive, a shared file system, or even a cloud drive directory such as Dropbox. If you save to a shared drive, beware not to have two people work on the same session file with Cytoscape at the same time, as unpredictable results may occur. The image export dialog has a variable number of options based on the file format selected, with file type and file name always being selectable. PNG and JPEG have options for scaling, while other formats only have a single option, Export Text as Font. The file name is suggested based on the name of the selected table with the path defaulting to the current working directory. As in raw data export, the suggested file name can be changed using the Browse button or the text field. Press OK to export an image with the given file name and parameters. We recommend using PDF for publications because it is a standard vector graphics format, and it is easy to edit in other applications such as Adobe Illustrator. For PDF export, there is an option to Export text as font. This option does not work for two-byte characters such as Chinese or Japanese. To avoid corrupted texts in the exported images, please uncheck this option when you publish networks including those non-English characters. The Web is an excellent platform for data sharing and collaboration, and Cytoscape provides a number of ways to publish your network on the web, with each choice representing tradeoffs between ease, simplicity, and customization options. 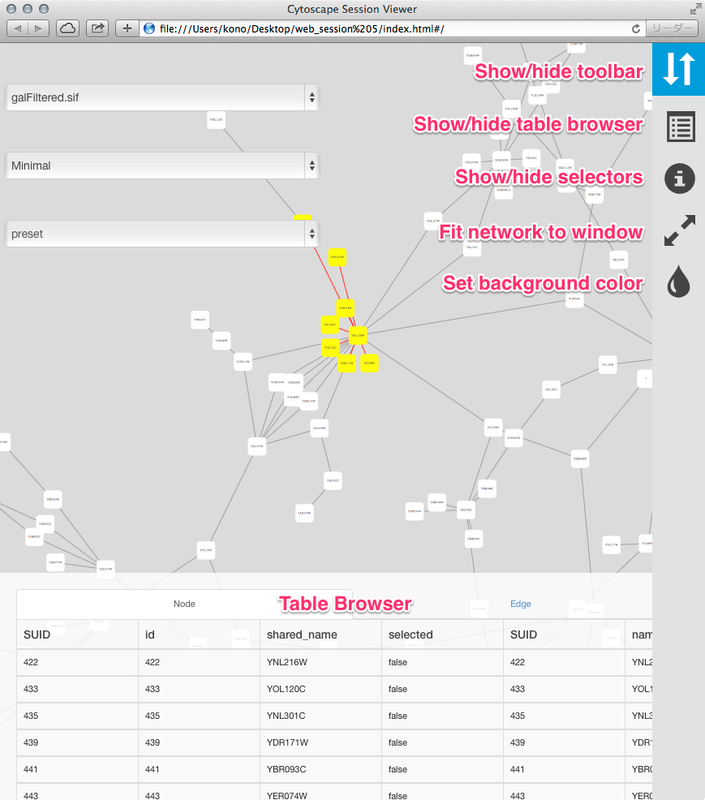 All solutions leverage the cytoscape.js drawing library, and so enable not only viewing but also Cytoscape-style interactive browsing of networks and attributes. The simplest choice is CyNetShare, where you save your network (and optionally a style) on a public file system, then interactively view the network in a browser. Like Google Maps, you can generate and publish a URL that allows collaborators to also view your network. Alternatively, Cytoscape can generate an entire web site showing a single page containing the viewer with your network pre-loaded. You can load this directly onto your own web server to become part of your web site. These features are available as Export menu items under the File menu, and are described in sections below. Note that web browsers can render small networks (e.g., 1000 nodes) quickly and effectively, but attempting to render large ones (e.g., 5000 nodes) will take a very long time. A word about exporting styles to interactive web applications: Our web applications are based on the cytoscape.js display library, which renders a subset of Cytoscape styles. 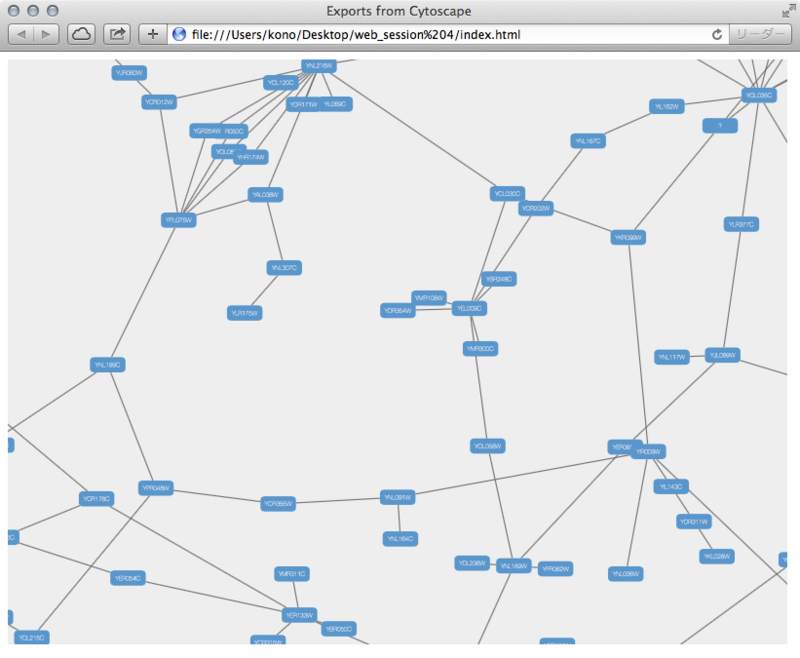 For more information, see the Export Styles to Cytoscape.js section below. CyNetShare is a browser-based web application that renders JSON-formatted networks and attributes saved in public directories. Optionally, you can specify visual styles that the web application will use to draw your network as it appears in Cytoscape. CyNetShare is similar to Google Maps in that once you have loaded your network and have tweaked its appearance to suit your needs, you can have CyNetShare generate a new URL that you can e-mail or post as a link on your own web site. That URL will bring up CyNetShare preloaded with your network for anyone to see. Select File → Export → Network to File… to export your network to a public directory. Choose the Cytoscape.js JSON (*.cyjs) export file format. Optionally, select File → Export → Style… to export your style settings. Choose the Style for cytoscape.js (*.json) export file format. Use your public directory system to determine direct URLs for the files you exported. Enter the network’s URL as the Graph URL. Optionally, enter the style’s URL. Note that if you specify a style URL, the style is added to the list of styles available in CyNetShare’s Visual Style dropdown, and you can apply the style by selecting it in the list. CyNetShare’s initial display uses the visual style named “default” – use the Visual Style dropdown to choose the style in effect when Cytoscape generated the .cyjs and .json files. Note that the mechanics of generating a URL for a file in a public directory system is a fast moving topic. Until recently, systems like Dropbox (and others) allowed users to create a URL that resolved directly to a file – a “direct” URL would be appropriate for use with CyNetShare. As of this writing, some public directory systems (e.g., Dropbox) generate “shareable” URLs instead, which resolve to a web page that allows file download – a “shareable” URL doesn’t work with CyNetShare. Systems that offer “shareable” URLs may offer “direct” URLs as part of their premium (or Pro) package. To tell if your public directory system generates a “direct” URL, have it generate a URL for a file, then paste the URL into the address field of a browser and observe whether the browser displays the file itself (good!) or a download page for the file (bad!). Hint: if Dropbox generates a “shareable” link that looks like https://www.dropbox.com/s/w5e7towcchuvdeu/cynetworm.cyjs?dl=0, you may be able to create a “direct” link by changing the dl=0 to dl=1: https://www.dropbox.com/s/w5e7towcchuvdeu/cynetworm.cyjs?dl=1. A simple strategy for always getting a “direct” URL is to store your file in a public directory served up by a web server, if you have access to one – a URL served by a web server might appear as: http://myserver.com/~mypublicdir/netstyle.json. This simple dialog has only two options - the file name and the type of web export (full, simple network view, or JSON). For full web application, we use the default. The file name is suggested based on the name of the selected table with the path defaulting to the current working directory. As in raw data export, the suggested file name can be changed using the Browse button or the text field. Press OK to export a web archive with the given file name. Note that because Cytoscape uses the latest HTML5-based web technologies, it cannot support older or non-conformant web browsers such as Internet Explorer. We strongly recommend using the latest version of modern web browsers such as Google Chrome, Mozilla Firefox, or Apple Safari. Everything else works as before, though this time the viewer will only include the current network. Press OK to proceed with the export. For instructions on testing the customized web application, see Generating a Full Web Application above. As of version 3.6.2 of the JSON Support core app in Cytoscape, the user may add custom Cytoscape.JS events to the exported webpage. In the web_session/scripts directory, a custom.js file has been added with a designated spot for custom JS code. // after the document has finished loading. This change has to be made each time you export a web page. If you want to change the default export template, refer to the next section. In this folder, you can find full and simple sub directories corresponding to Full Web Application and the Simple Network View described above. Once you have your own builds, you can deploy your templates by replacing the contents of full and simple with your own builds.